It dawned on me as we drove along the steep, rock strewn hills toward Ramallah that it was 30 years ago I first visited the Middle East region. I worked as a volunteer on a kibbutz in Israel for 6 months when I was 20. If you had told me I would spend the majority of my adult life living in the Middle East, I would never have believed it. But here I am sitting in my villa writing this article having spent the last 21 years living in Dubai. A year ago the brutal attacks by the Israelis on Gaza filled the TV and newspapers. I had been approached by PCRF UAE team to consider them as Yogafest Middle East’s charity project. After reviewing their audit reports and meeting with the team, I agreed to contribute to the construction of a cancer ward for children Gaza through our free Yoga events. I set a goal of raising AED 100,000 double what we had raised the year before. I was unprepared for the heartfelt gratitude from the Palestinian community in the UAE. Volunteers from PCRF attended each event to share information and sell raffle tickets and Sara and Terry, the founders of Lotus communications, offered their PR support. Six months and 10 events later we had raised exactly this amount for PCRF. This was the power of intention manifesting itself. 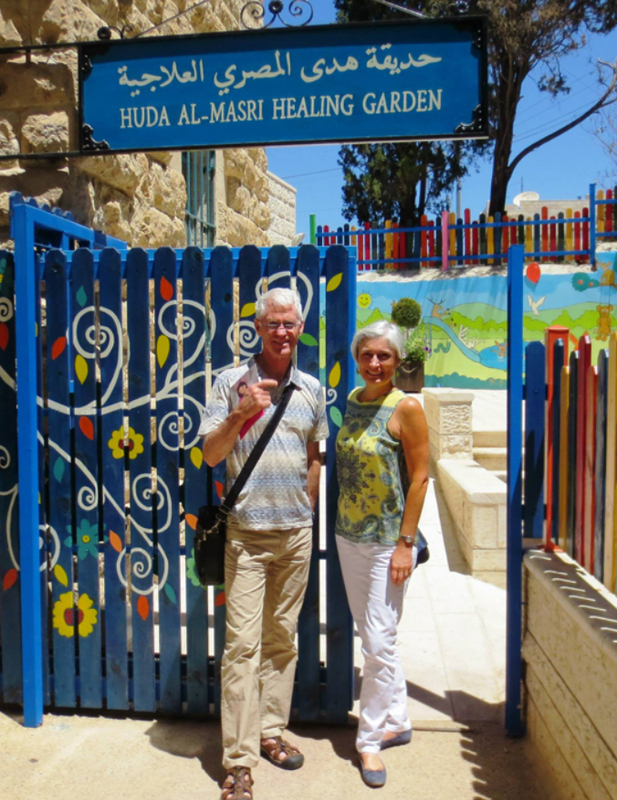 On May 6th I flew to Amman with my friend Pete, to cross the border into the West Bank to meet with PCRF founder, Steven Sosebee and visit PCRF’s Huda Al Masri cancer ward in Bethlehem. Landing on a beautiful sunny morning, we drove down the wadi towards the King Hussain Bridge (known on the Israeli side as Allenby Bridge, named after the British General who first built it in 1918). The driver had to drop us on the road outside the border building so a porter took our bags into the building where we had to surrender our passport to the officials and complete a small card. Our bags were then put through a scanner and we were told to board a large bus to travel 5 minutes across the border to the Israeli check post. Once off the bus, we had to hand over our bags and they disappeared into the terminal while we stood waiting for our passports to be checked. The Israelis control the border crossing and thoroughly check anyone wanting to enter. After the check we were more thoroughly interrogated. “Why were we coming, who were we seeing, had we been before, where were we staying etc. “ The young Israelis asking the questions decided to take our passports away and told us to wait. Most people come here to go to Jerusalem, but we were going to Ramallah to visit a ‘friend’ as we had been advised not to mention we were going to visit PCRF, as this would might lead to further delays and more questions. Several times Pete was asked to back for more questioning as I sat waiting and watching the people come in and pass to the other side. After two hours of waiting, we made a call to our friend on the other side, who called a contact and within minutes, we were given our passports and let through to collect our bags. Who knows how long we might have waited had it not been for our ‘connection’. Our friend Najim, a Syrian American working on infrastructure projects for USAID, was waiting for us outside the border control gate but we had to take a taxi to reach him. This cost a ridiculous 50 shekels which is equivalent to AED50 for a 5 minute drive! We had no choice. We were relieved to see him climbed into his cool white Jeep and headed for Ramallah. The border crossing is located near the Dead Sea and Jericho, at 300 m below sea level and is stiflingly hot. 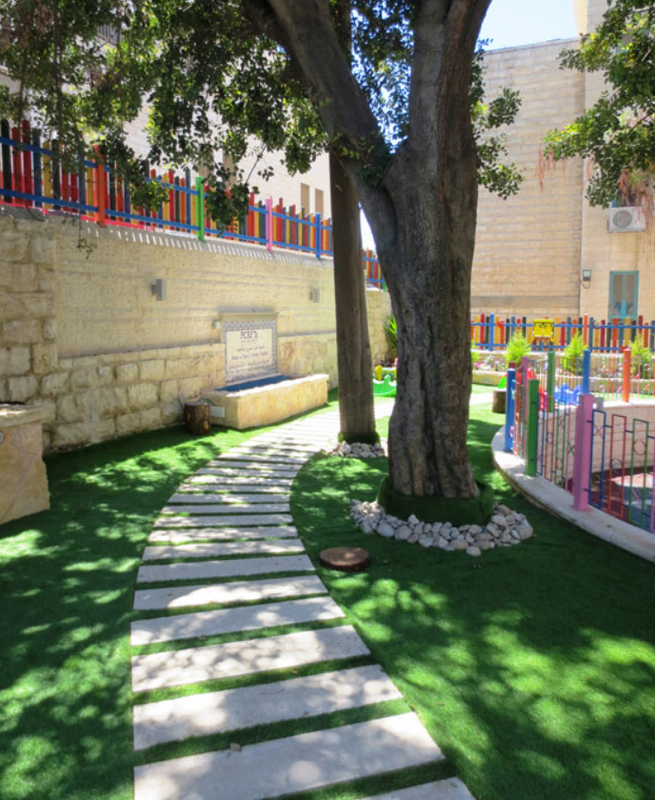 Ramallah, which means the ‘hill of God’ sits at 875m above sea level and is decidedly cooler. Originally a Christian city, it is the defacto administrative capital for the state of Palestine. It sits on many hills and what you notice right away is the tall sandstone apartment buildings with black water barrels lined on the roof and satellite dishes. We checked in to our hotel, the Crowne Suites, and then went for a tour of the city and a light dinner in a local restaurant. The next morning we drove to Bethlehem to visit the PCRF cancer ward in the local municipal hospital. Because of the check points and the delays they can cause, we opted to take the long route which instead of 30 minutes takes 90 minutes. The roads are windy and steep, many of them recently renovated by Najim’s company funded by USAid. I was struck by the irony of the US is building roads and funding the Israelis whose mission seems to be to destroy the West Bank and Gaza. As we approached the Beit Jala gov’t hospital, we saw the large blue sign that reads “Huda A Masri Cancer Ward for Children donated by PCRF”. 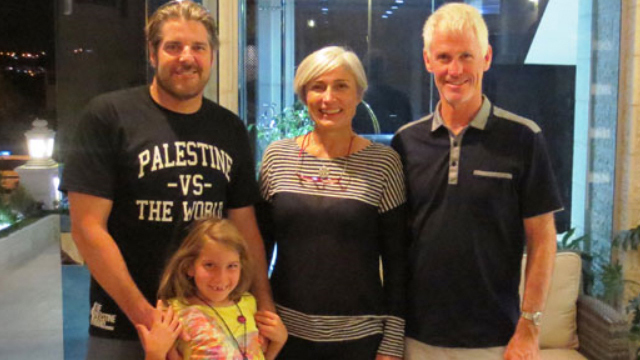 The Palestinian Children’ Relief Fund was founded by Steven Sosebee, who first came to Palestine in 1991 and met and married Huda Al Masri, a social worker for children with cancer, in 1993. Together they worked to bring medical teams to Palestine to perform life-saving operations on children. Tragically, Huda died in 2009 of leukemia leaving him with a 10 year old and one year old daughter. 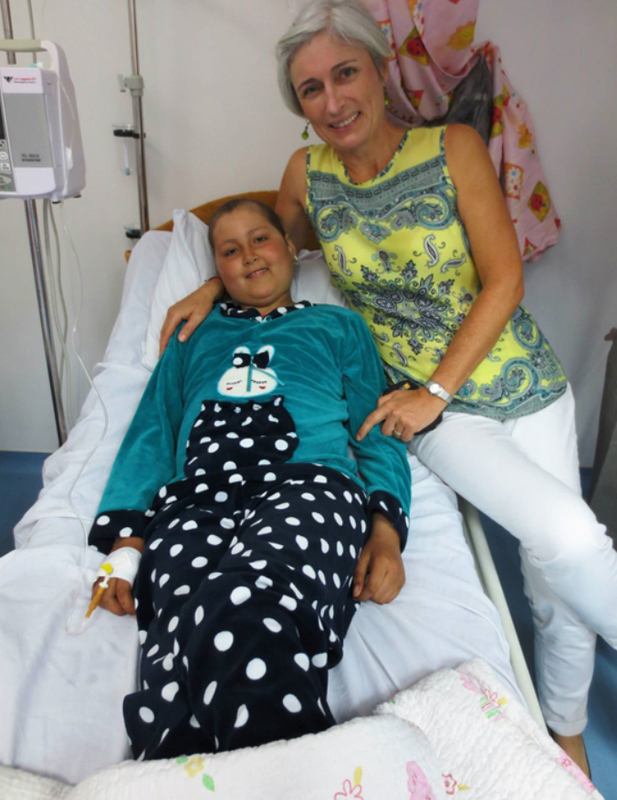 In 2013 the cancer ward was opened in her memory and treats over 100 children a year. We were met by Naveen, the social worker and administrator, who took us a tour of the ward and to meet the children being treated. As you enter the ward, there are photos of the various fundraising efforts and donors along with a photo of Huda and her two daughters. You feel the sense of care and love as you walk down the corridors towards the children’s playroom, brightly decorated with scenes from the Jungle book. There we met an 8 year old girl with leukemia who was having an English lesson with her tutor. She was wearing a blue hat and spotted pajamas. She wheeled her intravenous device towards us so we could take her photo and I felt my heart sink as she gave us a gentle smile and returned to her studies grateful for the small gift I gave her. We then went to visit the children in the 8 treatment rooms. We met a two year old boy with long dark eye lashes and thick wavy hair, who was recently admitted with Leukemia. His mother was trying to get him to eat a banana. I handed him the toy I had brought, a fan that lights up when you press the button and he loved it. His big brown eyes lit up but there was a heaviness behind his eyes which I imagined was the chemo treatment in his veins. Next we visited a 10 year old girl lying in bed in her green pajamas, her tutor by her side, giving her a math lesson. 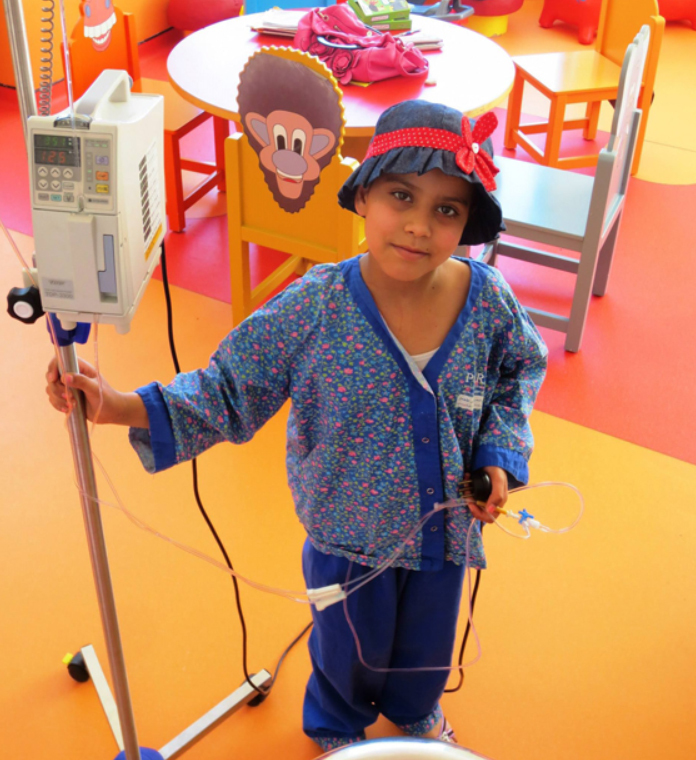 Naveen told us how smart she is and how well she was responding to the treatment. My fan gift was not appropriate but she smiled and took it. Our final meeting was with a young boy of 13 who seemed quite ill and was receiving a treatment through intravenous. I handed him a football and he took it with a weary hand and said thank you. His father arrived and greeted us. We learned he had not responded well to the treatment and the tumor in his abdomen had grown and there was nothing more they could do for him. The doctors had just that morning given hisfather the news and told him to take him home. He was the eldest of 5 children and the only one born ‘normal’. The other children were all physically handicapped. Feeling sad and helpless, we left father and son and went downstairs and outside to visit the recently opened Healing Garden. Here outpatient children visiting for their weekly checkups can play on the swings and slides. It’s also somewhere for the parents to sit and have a moment of peace. It is here yoga classes will be offered to the children and parents in the coming months. Naveen thanked us for our donations and bid us farewell and we walked towards our car, our eyes wet with tears and heaviness in our hearts. The money we donated with build a similar cancer ward in Gaza where the situation is far worse. I left determined to return when the ward opens in 3 years and resolved to be able to speak to the children in Arabic when I return. As we drove back to Ramallah into the setting sun what struck me was the patience and determination of these people who despite living in an apartheid regime, exhibit no hatred for their captors. They want peace and to live on the land that their forefathers have inhabited for centuries. They love their land as they love their children, every olive tree and rock, is steeped in history. The next day we visited Eilda Zagmout, a young woman of Christian faith who recently opened, Beit Shams, the first yoga studio in Bethlehem. 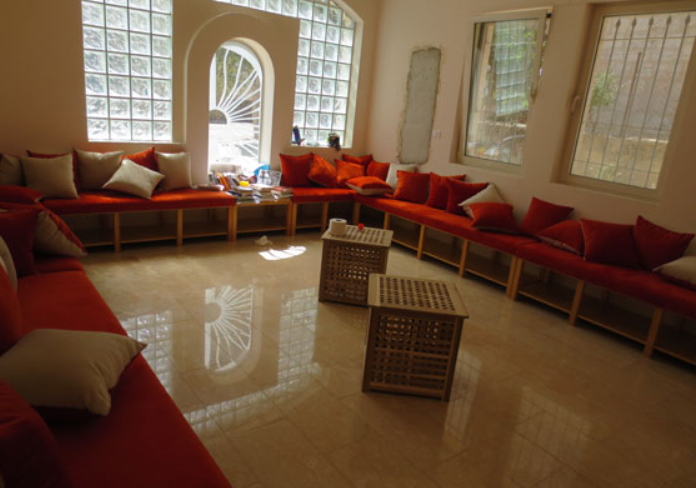 She offers community classes for women, as well as workshops and a reading room. She received a scholarship to complete her 200 hour teacher training last year. Her plan is to provide a haven for women and to offer yoga classes for the mothers and children being treated by PCRF. She believes the battle is not Israeli against Palestinian but justice again injustice. “When people see each other as human beings with equal rights, when they can love themselves and have compassion, they will feel this for others,” she told me and I totally agree. I was struck by her story, by her family’s decision to leave Jordan and return to the holy land to be part of the movement to find a peaceful end to the occupation of their lands. The entire trip was filled with encounters with such people, kind and generous individuals trying in their own way to make a difference. 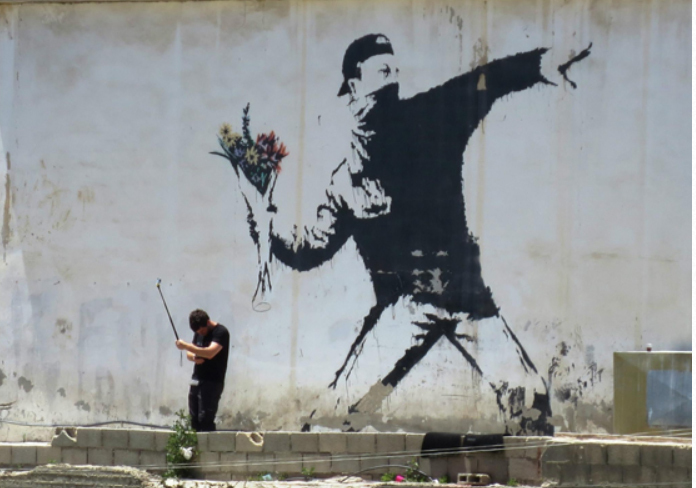 And what I left with was a sense of hope that the way forward is a non-violent protest against the suppression. Yoga is about connection, with ourselves, with our breath, with the divine in each of us. Yoga is how I raised AED 100,000 for PCRF. 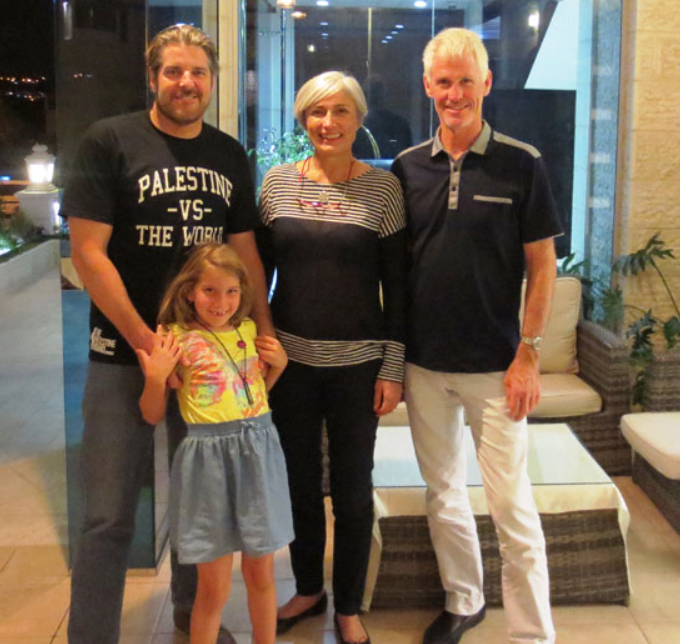 On our last night we met with Steven and his 8 year old daughter, Jenna, at our hotel. He is a relaxed, determined and caring man who has devoted his life to helping the real victims of this conflict, the children of Palestine. As we chatted, Jenna curled in his lap, drawing pictures, he told us of his daily struggles being a single parent, the tightening restrictions on getting patients in and out of Gaza and his hopes for the future, one where Palestinians have their own state, where the Israeli occupation will end and children can look forward to a positive future. In the hands of such a humble and determined man, the children of Palestine have a guardian angel and I am glad our contribution will support his heroic efforts. Thank you to each and every one who supported PCRF this year, for making this donation and trip possible. It proves the power of one person to make a difference supported by many. This is how yoga will change our world in the years ahead. To see more photos click here. 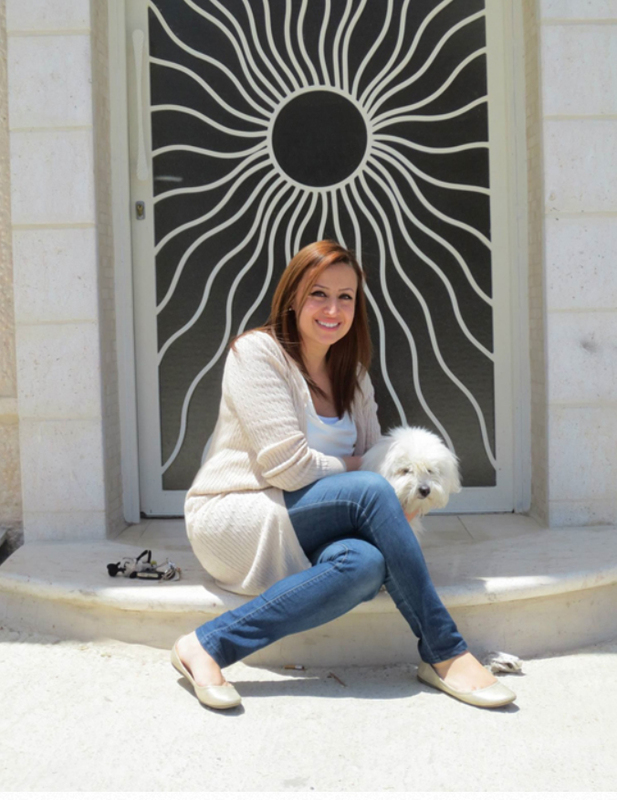 Elaine Kelly founded Yogafest ME, the largest and only sustainable wellness event in the Middle East, in 2010 when she became a certified yoga teacher while working for Microsoft. With 30 years experience in the fitness industry, she wanted to support her fellow employees with their work life balance, and the idea for Yogafest was born. Thank you for subscribing to our mailing list for regular updates.